Do you ever find that when you go into your closet to pull out your coziest sweater, it suddenly has a gaping hole? Well, you're not alone, and how that hole got there isn't exactly a mystery. The culprit is likely as simple as a clothing moth. You might be thinking, "There aren't any moths flying around my home." And it's probably true you haven't seen any. But clothing moths are nocturnal and do their work in the darkest corners of your home. Your closet or dresser drawers are prime breeding grounds. 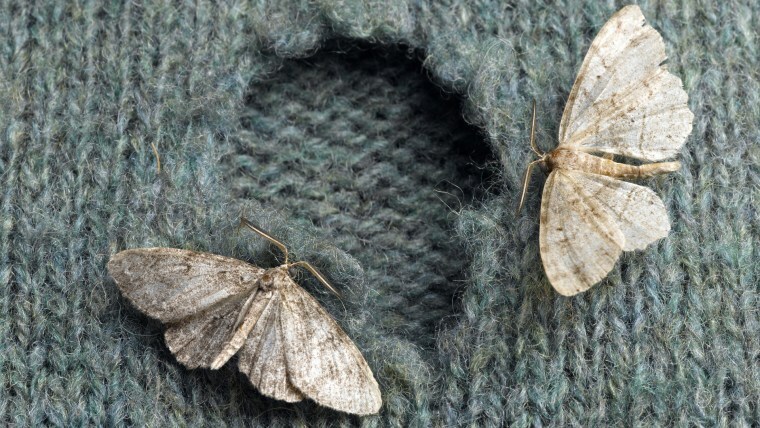 Those pesky holes in your sweaters, scarves and coats are a result of the adult moths laying eggs on your coziest goods. The eggs morph into larvae, which feed on natural fibers like wool, cashmere and silk. "They like the good stuff," said Jerry Quinlan, an entomologist with Assured Environments, a pest control company in New York and New Jersey. The larvae are so small that if you don't know what to look for, you could easily miss them. They are only about a quarter to one-half inch long and leave white stringy trails, similar to a cobweb. What causes the moths to be attracted to your clothes in the first place? "The larvae feed on fabric that has bodily fluid on it, like sweat, saliva, oil and even food," said Joe Fryer, director of operations for New York-based JP McHale Pest Management Inc. "It's minute amounts." While the larvae are initially attracted to natural or animal fiber, they could also be attracted to synthetic fiber soiled with bodily fluids or even pet fur, explained Quinlan. What do you do if you notice a moth hole? "Isolate the product in a sealed Ziploc bag or a trash bag. It's important to contain it and keep it isolated," said Chelle Hartzer, manager of technical services for Orkin and a board-certified entomologist. She added, "Insects don't like extreme temperatures, extreme cold or heat. You can put your item in the dryer for 30 minutes or try a deep freeze, which can take longer." Hartzer warned to read the cleaning labels of your item carefully in order not to shrink it. For fine wool, cashmere and silk, dry cleaning will also get the job done. "It will kill the first three stages of the moth," said Fryer about dry cleaning. If you find just one damaged item, there's no need to call professionals. A simple cleaning of the item will do the trick, since moths aren't a filth pest. Make sure to do a quick wipe of the shelves to clean up any remaining eggs. However, Quinlan said if you find a hole in one of your garments, that doesn't necessarily mean it was caused by a clothing moth. The damage could have been caused by a carpet beetle or other insect. How do you stop the damage? "The best thing to do is to find the source," said Hartzer. "Look for any of those natural products in your home." What could be the source? The source may not be in your closet. The pests could be hiding in the lapel of your favorite winter coat or even running shoes or hat. Fryer said he's found that fine oriental rugs stored away in an attic or basement are usually the culprit. He also said that carcasses of mice or other vermin that are caught in the wall could be the issue. Any sofa or chair that is made of natural fibers can also be the source, explained Fryer. Quinlan explained that the moths can creep into the crevasses at the baseboard for wall-to-wall carpeting. He said that if you live in an older home and the insulation is made out of horse hair, moths can easily find their way into there. He said he has found other sources of moths, too, like taxidermied animals, furniture with feathers, and bookshelves and credenzas that aren't moved frequently. How do you prevent clothing moths from getting to your clothes? When it comes to preventing moths, the easiest thing to do is wash or dry-clean clothes that are made out of natural fibers after each wear, suggested Fryer. The smallest bit of soup on your sleeve, saliva or even oil from your face could attract a moth and its eggs. "Don't pack tight your sweaters. It's a much more inviting environment," said Fryer. Instead of stacking them on a shelf or putting them all in a drawer, he advises separating them if possible. Hanging them all next to each other isn't ideal, either. If you do have to stack or pack your sweaters tightly, leave them in plastic. You can even try putting a garment bag that zips around your rack in the closet. Fryer mentioned that most of the damage occurs when you go to store your sweaters over the summer months. Before putting them into plastic bins or — even better — airtight Ziploc bags, be sure to wash each garment and inspect it for any holes. He also suggested placing the items in the attic of your home, where temperatures can soar above 100 degrees Fahrenheit in the summer, making it difficult for moths to survive. Of course, there's always the good old trick of using cedar in your closet, but be sure to replace it periodically. You can skip the moth balls, Fryer said — they really don't work. Here's to hoping your favorite sweaters and garments remain moth-hole free!